A long time ago in a gym far, far away, I was a new trainer with the ink barely dry on my first certification from ACE. A new member at the health club where I worked came up to me and she was quite upset. She was angry that she’d been doing the workout I created for her, but had recently injured her back while putting her child in the car seat. As was common practice back then, I was creating strictly machine-based programs for new members during the free session they received with their membership. This experience with this clearly dissatisfied health club member got me thinking: Was the machine-only program I used for these free sessions really preparing people for life? Fitness leadership means providing clients with continually challenging workouts that also follow sound principles of movement-based training. It merges high intensity with high quality. The former is in ever-increasing abundance in the fitness world, often at the expense of the latter. High intensity is easy to find. High intensity with high quality is considerably less common. The best concepts are the ones that immediately translate to real-world, real-life experiences. They are the ones that provide an easy bridge between an idea and an experience everyone has in his or her own body. Importantly, this helps to eliminate the disconnect many people experience between the exercises they do during a workout and the movements they perform in everyday life. As a health and exercise professional, you have a unique opportunity to help clients make the connection between life movement and exercise. When we choose equipment people like to use to develop workouts intense enough to create change, and ensure that those workouts translate well to life, the program is far more likely to “click” for the people we serve. Making that connection between movement training and real life is at the core of the ACE Integrated Fitness Training® (ACE IFT®) Model. The Functional Movement and Resistance Training component provides a framework for developing stability or mobility as appropriate in a specific area of the body (phase 1), integrating it into a full-body movement (phase 2), adding external load and creating a stimulus for strength gains (phase 3) and increasing movement speed to develop bodily control and power (phase 4). The following workout features the MostFit Core Hammer, was designed using the ACE IFT Model as a guide, and highlights each of these movements (see ACE IFT Model Movements and Fitness Characteristics below). The MostFit Core Hammer eliminates the need for a bulky tire for sledgehammer exercises. It’s versatile enough that you can strike it against the ground, a wall, driveway or a cement floor. Or, you can use it like a mace to develop shoulder strength, mobility and stability. The long lever and distally loaded end provide endless options for unilateral and asymmetrical strength challenges, core exercises and rotational, mobility and stability work—all of which are featured in the workout presented here. It is available in 8-pound (3.6 kg) and 12-pound (5.4 kg) sizes. The 8-pound version is used in the videos that accompany each exercise. Hand positioning affects the intensity of the exercise due to the physics of rotation. 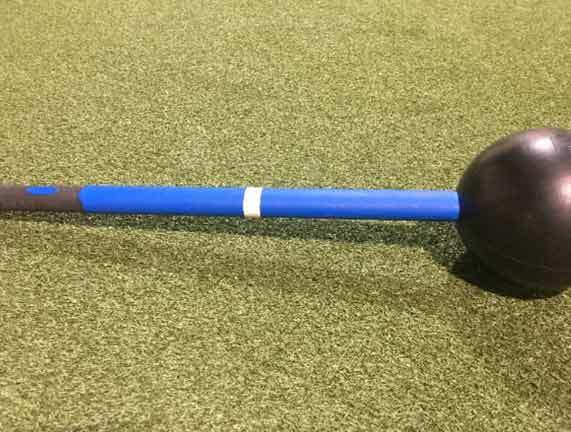 In the photo above, the piece of white tape in the middle of the blue area of the handle marks the spot where your hand is positioned when performing most of the exercises. Like a car, you steer the hammer with your arms, while the engine of movement is your trunk, hips and legs. Your arms are the steering wheel and the rest of your body is the engine. On the two “Hammer Drop” exercises, the farther away your upper hand is from the head of the hammer, the harder the exercise will be. As you lift the hammer in preparation to strike, your upper hand should be as close to the head of the hammer as possible. When striking, the upper hand slides rapidly down the handle to provide maximum rotational power to the head of the hammer. During the Side Lunge Thrust exercise, thrusting to the ipsilateral side (same as the side you step toward) increases the load, while thrusting to the contralateral side (opposite the side you step toward) decreases the load. For the Single-arm Shoulder Press and Row, moving the hand farther away from the head of the hammer increases the challenge of the exercise. Keep the lower body stable and use thoracic rotation when performing the Horizontal Swing to both create and slow down forces. During the Walking Lunge Hammer Drop, note that the hammer drops toward the lead leg to more closely mirror natural gait patterns and to add load to the glute on the lead leg. This workout features supersets of two exercises (exercises A and B). Perform each movement, rest for about 20 seconds between each superset, and complete each superset two to three times depending on available time and your client’s current ability. Perform one set of the “Finisher” exercise at the end. Successfully manipulating a large, extended weight like the Core Hammer easily maps to many life movements. Changing the location of the grip on the strength movements will provide insights on strength and ability as this greatly changes the rotational forces. And let’s face it, there is a lot of fun in swinging a hammer around. Many clients will enjoy the challenge as well as the thrill of swinging the hammer.